Why Does My Dog Vomit After Eating? Q: My beloved rescue dog often vomits after he eats; is it a digestion issue, food issue, or how he eats (he scarfs down his food in no time)… what can I do? A: You have reason to be concerned. Of course it depends on how soon after and how often this occurs, but scarfing down his food can cause serious health problems. Eating too fast can cause burping and flatulence (not dangerous, but can be unpleasant), choking, gastric dilatation, or volvulus, which is also known as bloat. Bloat is a condition that needs to be treated by a veterinarian immediately. It can occur when a dog swallows too much air when they are eating their meals and the distension of the stomach can cause it to twist. This can cause damage to the stomach and even death. To slow down your dogs eating, you need to determine the cause. 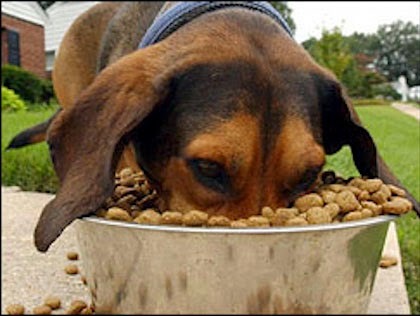 Being a rescue dog it could be a case of conditioned competitive eating (often occurs in a shelter situation). If you have another pet, consider feeding them in different locations or times. Feeding your pet regularly will also help them have food security. Also use distraction with positive reinforcement to keep them from the other pet’s bowl can help too. However, if they are the only pet in the house you can try to change how you are feeding them. Changing the bowl can help. You can purchase a slow feed pet bowl, or make your own at home version by turning their feeding bowl upside down or using a muffin tin to separate their food to force them to pause. You can also feed smaller, more frequent meals. Two supplements can greatly improve your dog's digestion. Power Probiotics for Pets and K9 Digestive Enzymes will help your dog properly digest his food and reduce vomiting instances. Dogs can suffer from malabsorption and even though they are eating the food quickly, they will not get the benefit of the nutrients if they are not digesting the food properly.